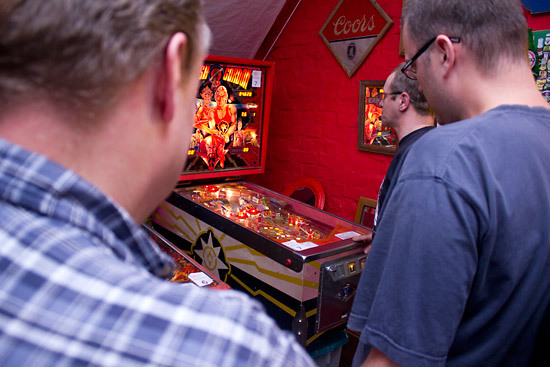 For the third year running, the arrival of the third Sunday in September meant it was time for Ochran Mill to host the Welsh Classic Pinball Open. 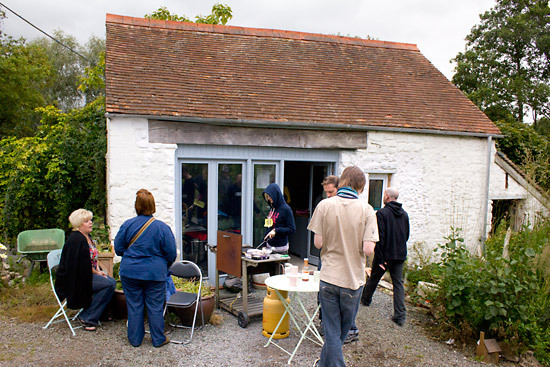 The weather may not have been as good as last year but it stayed mainly dry and didn't prevent regular use of the barbeque as sausages and burgers were served up to guests. The costs for this year's Classic went up from £5 ($7.78) to £7.50 ($10.89) but in return, all the food and soft drinks were free - including the burgers and hot dogs, cakes, scones, ham rolls and plenty more besides. 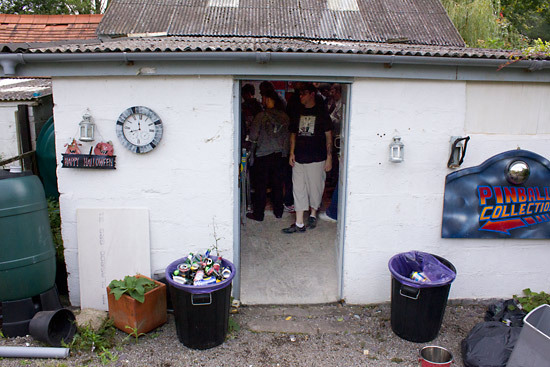 If that wasn't enough, there was a food festival being held in nearby Abergavenny offering a wide variety of local produce and unusual comestibles. 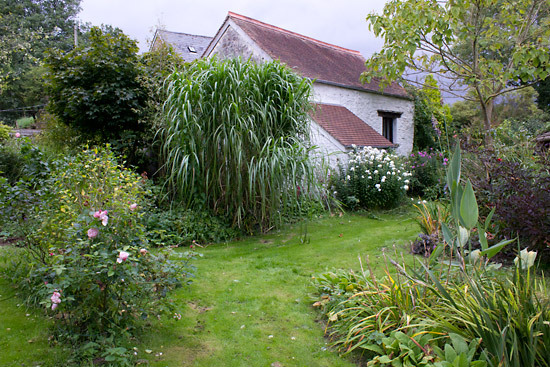 The Welsh Classic received plenty of prior publicity thanks to several features in the local newspaper and on both local and national radio. 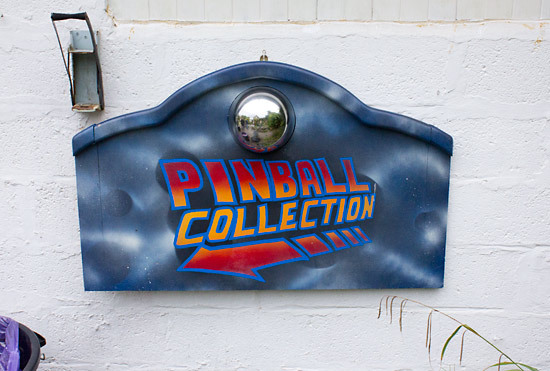 For some, the pinball weekend began on Friday as they arrived that evening to help celebrate one of the guest's birthday. 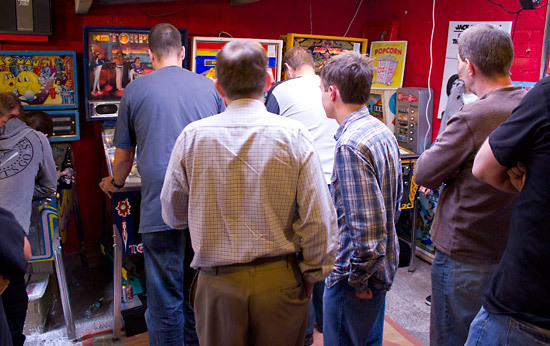 Others joined the party on Saturday and played pinball late into the night. 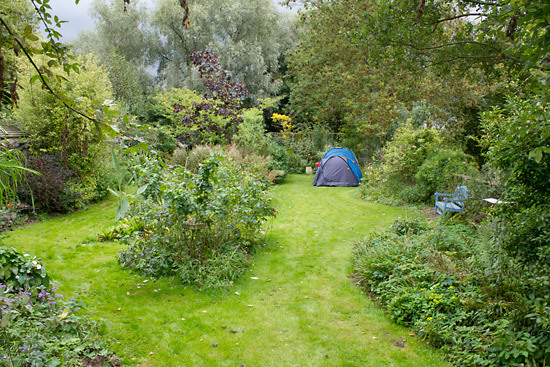 Camping was available in the gardens which are opened to the public on selected weekends throughout the year. 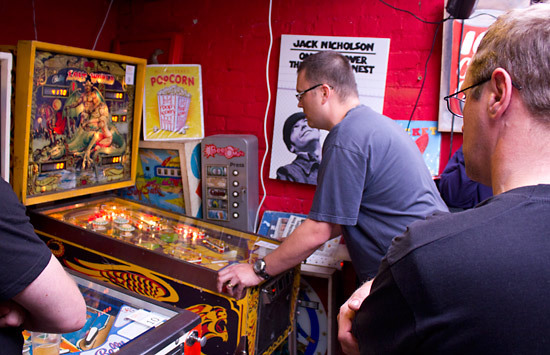 But this weekend, most visitors were here for the pinball which was to be found in the outbuilding next to one of the seating areas. Just in case the sounds of laughter, electronic beeps and solenoids firing wasn't enough of a clue, there was a homemade sign to direct you to the games. 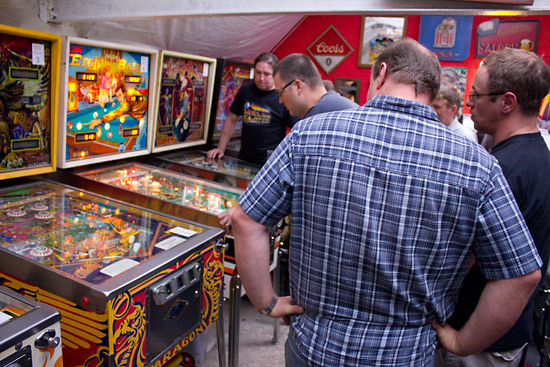 Inside the building, 11 solid-state machines were set up for the tournament. Most were set to 5-ball play but some were on 4-ball. Practice was allowed right up until the start of the tournament on these eleven and the Revenge from Mars set up in the cafe. 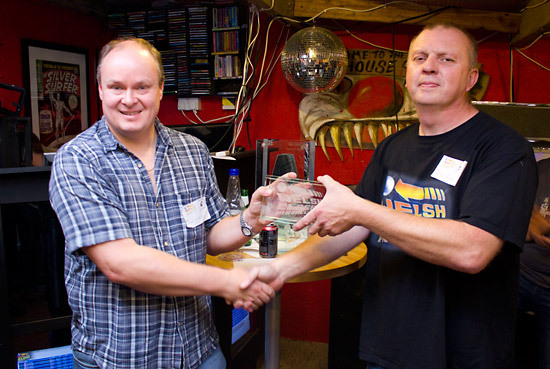 Dave Rolfe was in charge of the whole event while Peter Blakemore ran the tournament itself. Chris Williams got the players registered so that the tournament could get under way around midday. 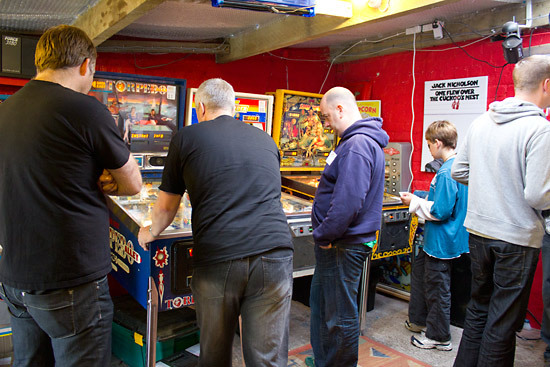 Forty-nine players entered the tournament and in the first round they got to play their choice of six from the eleven machines available. 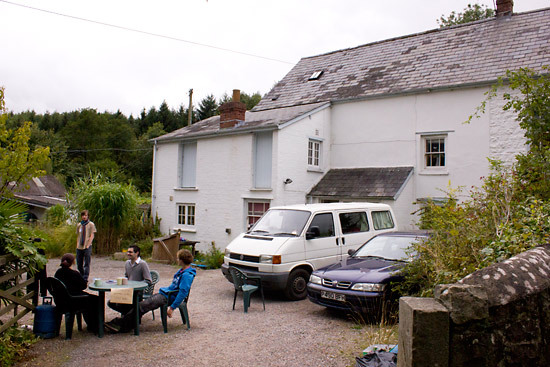 Their scores were recorded on player cards and handed in to Peter when all six games had been completed. 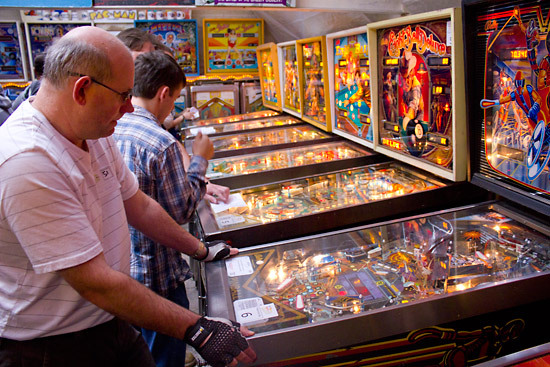 The scores on each machine were ranked and ranking points awarded, with 100 points for the top score. 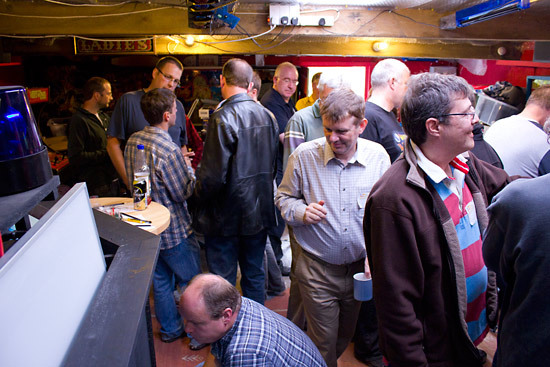 Peter used a modified version of the UK Pinball Open/EPC 2009 scoring system to rank the scores and display the standings on a number of monitors mounted below the desk. The top 16 ranked players moved on from the qualifying round into the semi-finals. 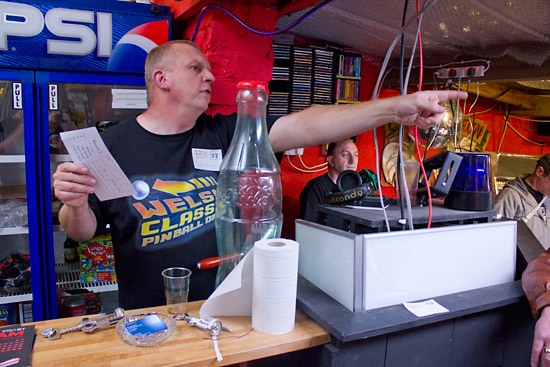 In the semi-finals, the sixteen qualifiers were formed into four groups of four and played the three games at the front of the building - Torpedo Alley, Night Rider and Lost World. 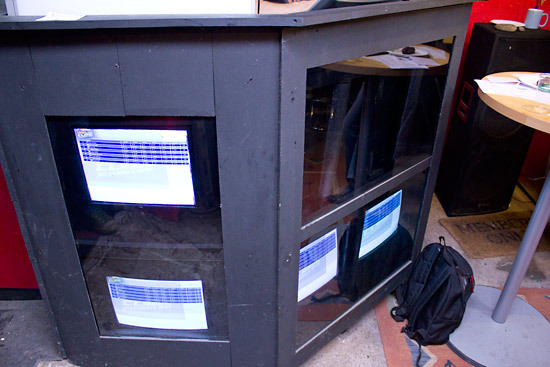 All the scores on these three machines were ranked, along with a virtual fourth machine made up of the rankings from the qualifying round above. This made those qualifying round positions important if you wanted to progress, since only the top 4 players would go into the final rounds. 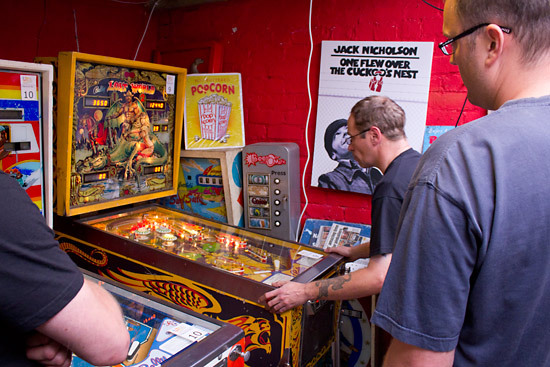 So Mike, Nick, Dave and Stan played in the final which consisted of games played on three machines drawn at random. On each game, the lowest scoring player dropped out to eventually leave just the tournament winner. 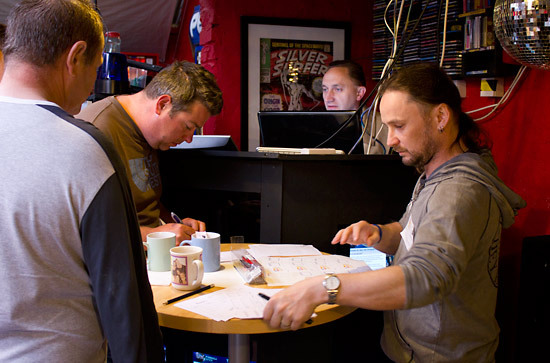 The order of play was chosen first by Mike as highest qualifier from the semi-final, followed by Nick and then Dave. The first game drawn was Flash Gordon and last year's winner Nick Marshall got off to a good start, racking up over a million points to win the first game. Flash Gordon proved to be the undoing of top qualifier Mike Kindler who was eliminated from the final and ended up in fourth place. 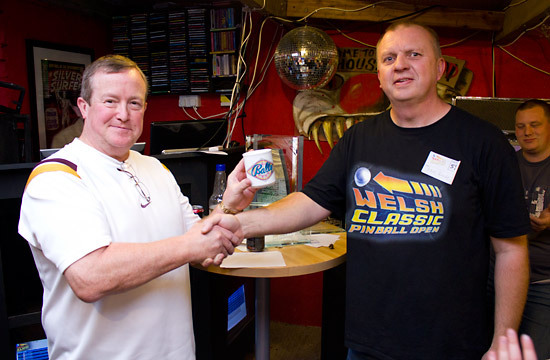 Play then moved onto the nearby Eight Ball and this time it was Stan who took top spot with Nick in second and Dave Langley taking third. 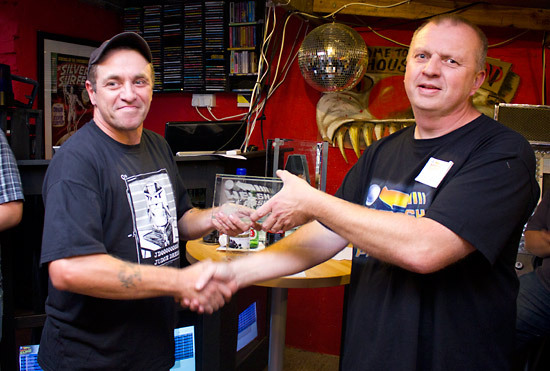 That meant Dave was knocked out of the final and ended the tournament in third place. 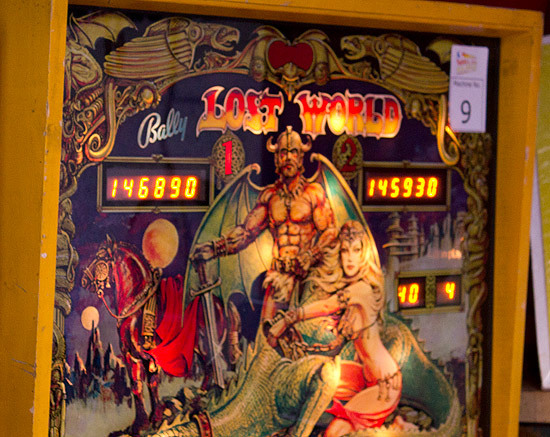 Since he won on the Eight Ball, Stan had choice of play order in the third and final game which was played on Lost World. He chose to play second, so Nick went first. Although he drew out an early lead, Nick was nearly caught by Stan on the fourth ball. In fact, as they prepared to play their final balls, less than 1,000 points separated them. Those fifth balls boosted Nick's score more than Stan's, giving Nick the win and retention of the champion's title by 192,800 to 162,000. 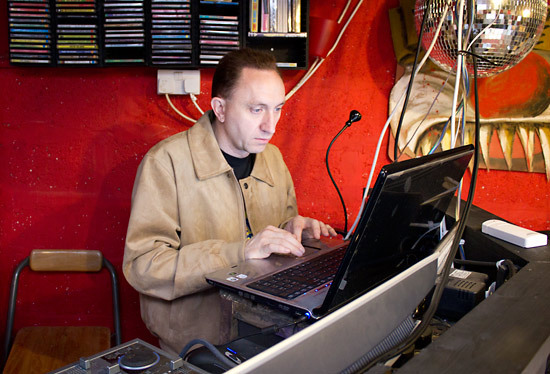 An awards ceremony then took place for the four finalists. In addition to winning an etched trophy he gets to keep - like those awarded to Dave and Stan - Nick got custody of the perpetual trophy shown above for another year. Host Dave Rolfe said if he wins for the third year in a row he can keep it. 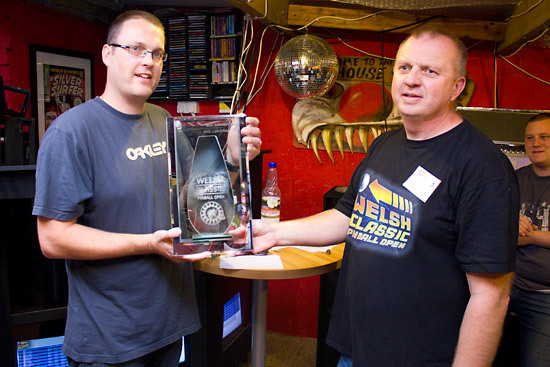 With the presentations completed, Dave thanked everyone for coming and the third annual Welsh Classic Pinball Open came to an end. Here are the full rankings for all 49 players.